My Great Dane, spayed female, 7 years old next month, has for her entire life experienced episodes of small hot spots and pustulating rashes. In the first years it started in spring and worsened until the end of summer, but did not get too bad and did not itch. Four years ago we started needing antibiotics to make it go away, that same year it started itching. Three years ago we needed to also use malaseb shampoo, last year it was an immense struggle to control it and it opened huge pustulating sores all over her body. Finally we got it under control. THIS year it is not responding to anything the vet throws at it (antibiotics, hypoallergenic diet, anti-itch shampoos, nothing). It is spreading very fast. Over the years we have tried most of the sensitive-skin diets on the market and have been to the vet maybe 20 times about this. In the last few months she's had a complete allergy blood workup (no allergies found); scrapings and lab tests for bacteria, parasites, and fungi (no fungi, no parasites, bacteria just overgrowth of normal skin population); a complete workup to investigate her hormonal levels, look for cancer, determine internal organ functioning (she has "the blood of a young dog" and no unusual findings turned up). She also had two skin biopsies which revealed only "chronic dermatitis". As I said it's getting worse fast and starting to seriously affect her quality of life, and we're afraid for what we may have to decide about her future. bath), leaving large areas which crust over and pustulate. It itches a lot despite the anti-itch shampoo from the vet. What I'm looking for with this letter is any suggestions for things we can ask the vet to try or to investigate. But so far it appears this may end up killing her without ever being fully understood. Any help is appreciated. I am so sorry to hear about your dog’s condition. A few things come to mind that would be worth pursuing if you haven’t already. 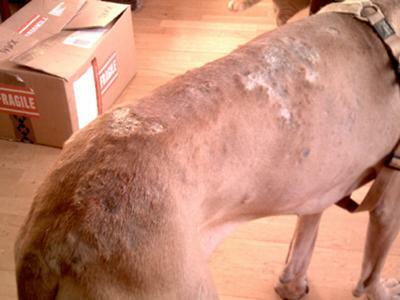 First, consider making an appointment with a veterinary dermatologist. Get copies of your dog’s records, test results, etc. and send them to the office well before your appointment so the veterinarian has a chance to review them and come up with a tentative plan before seeing you. Then, he or she will be prepared to move forward with a new diagnostic approach. Board-certified dermatologists are up to date on the latest and most advanced diagnostic tools and treatment options. It’s just not possible for a general practitioner to have all the knowledge that a specialist does. Secondly, I know you mentioned that your dog’s blood testing for allergies was negative, but these types of tests are not as accurate as are the intradermal allergy tests that are usually performed by dermatologists. Your dog’s symptoms, especially the fact that they were initially seasonal but then progressed, fit very well with an environmental allergy (e.g., to a particular type of pollen or mold). Drugs like prednisone and/or cyclosporine (Atopica) can make a world of difference to dogs with environmental allergies. They are not without potential side-effects of course, but in your dog’s case the benefits might certainly outweigh the risks. My 9 month old Bullmastiff is experiencing something very similar. Over a month ago it started with one hot spot and now he has patches of hairloss all over his back and hyperpigmentation. The title of this article says solved. What was the disease and how was it solved? I have a six year old English Bulldog and we battled with this same issue year after year, with countless trips to the vet and medicines ranging from fungal/bacteria meds to antibiotics. Nothing worked except our credit card;lol. Finally, we saw a beuatiful bulldog at the park with the most amazing coat! When asked what they fed their dog, they answered Pro Pak. We decided to try it and we have not had the skin issue since!We found it at a local pet store and it's very resonably priced; around $30 for a fifty pound bag. Give it a try! it works! Silver Rain Soap kills Staph and clears up many skin problems. It is simple and easy. Just wash your dog in it or spray it directly on the skin. It is amazing how fast the problems go away.